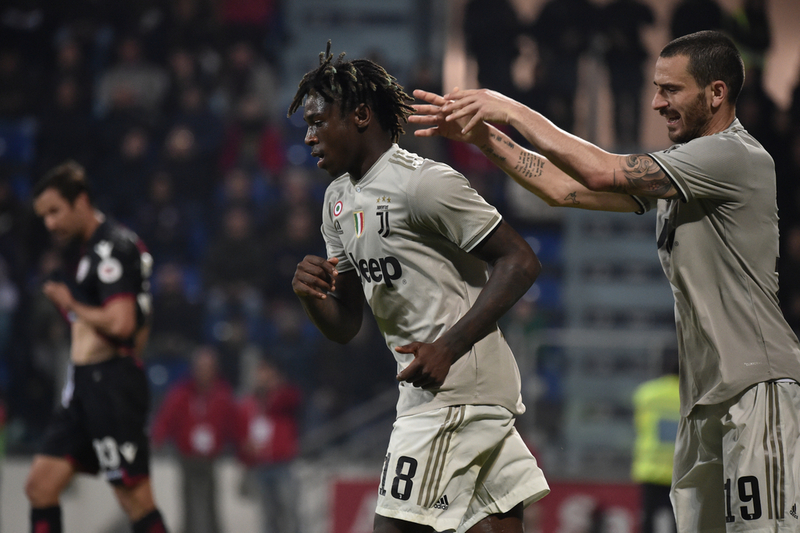 Juventus forward Moise Kean was the subject of racist chanting on Tuesday night during his side’s 2-0 victory over Cagliari on Tuesday night. The 19-year-old was playing in just his 13th game for the Serie A champions when he became the target of monkey chants from a section of the home supporters, but had the last laugh when he scored the decisive second goal five minutes from the end. In response, Kean stood defiantly in front of the home fans with his arms aloft to his side, while his teammate Blaise Matuidi appealed to manager Massimilano Allegri for his team to leave the pitch to stand against the abuse. Cagliari captain Luca Ceppitelli also went over to the supporters behind the goal to plead them to stop their chanting, while captain Giorgio Chiellini also had discussions with the referee about it. No action was taken, with the game continuing as normal after an announcement on the public address system asking them to stop, which was in turn only met with further jeers from the home crowd. Shockingly, rather than defend his player, Juventus manager Allegri instead chose to criticise the conduct of Kean’s celebration whilst also calling for lifetime bans for those guilty. Juventus defender Bonucci echoed his manager’s thoughts, believing that Kean was wrong to react the way he did, rather than come out and publicly support the young striker. "There were racist jeers after the goal, Blaise heard it and was angered. I think the blame is 50-50, because Moise shouldn't have celebrated like that, and the Curva should not have reacted that way," he added. Whilst the attitudes of Allegri and Bonucci remain, the issue of racism will not be stamped out of Italian football any time soon and demonstrates in itself why it remains such a problem in the game.